This Sunday I'll be returning to The Tobacco Road Half Marathon as a final test run before the final phase of Boston training. 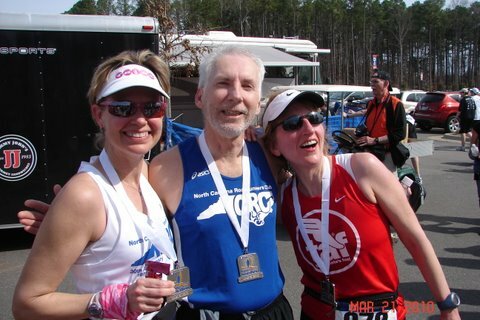 Last year I did the full marathon where I got my qualifier along with my training partners Karla and Lisa. It just happened that the timing of this race fit perfectly into the schedule building up to Boston so the three of us planned and entered it early to guarantee a spot in the race which once again is full. As I noted in a recent post , my training has been going well and I just completed another great week of running. Although I haven't focused on this race I would still like t perform well so even though I haven't done a real taper I did back off on the mileage a little bit this week. It looks like we will get lucky with great weather again like last year, with the start in the mid 40's and warming up to the upper 60's but probably no higher than the 50's by the time I finish. Frank will once again be running the half and since Karla has been dealing with foot issues since last Fall they will probably be close this year. The Ultra Angel Jenn will be running the full as well as Jerry. There are lots of other friends and a big presence from the NCRC so I'm looking forward to a lot of fun Sunday morning ! And in case you're wondering I'm going for the sub 1:45 again. Hopefully with no being sick and no gale force winds I'll be able to do it. Good luck tomorrow . . . weather should be nice!